Anthony Barr hasn’t had much hype this year, yet only five players in college football have more sacks in 2012. Three of those five are Bjoern Werner, Jadeveon Clowney and Damontre Moore. Barr has 12 for the season in total, with the PAC-12 Championship game up next on Friday. He’s listed at 6-4 and 235lbs – about the right size to play the WILL in Seattle. Take a look and see what you think. Awesome thanks for this vid. Honestly I haven’t got time to watch this guy but I was asking about him a few weeks back and was interested ever since the UCLA-Ne game. Rob, if you have had a chance to check him out much can you say if they three point him on passing downs or have most his sacks come on a blitz from the LB spot? Everytime I have seen Barr, he screams Seahawk (similar to Ogletree). Very unique guy that I think is a little Von Millerish. Wouldn’t mind seeing him at the end of Round 1. I’d wait till the second. If Ogletree or Hertz is there, grab ’em. If not, look for DT. A big guy with good burst and strength at the point of attack. I like that Sylvester fellow over at UNC. Then take Barr in second in this scenario, haven,t looked into the LB class this year… Gonna start that now. What if Born Werner was available for us? Or Margus Hunt in the second? Or Jesse Williams in the second? As a UCLA grad and booster, I’ve watched most of the Bruins’ games this year. Barr is a converted FB. 2012 is his first year playing LB. To me, he’s really raw and doesn’t appear to have the instincts that someone would have if they had played LB for a longer time (no surprise). Look at the video and you will see that he takes a long time to read what the offense is doing and then reacting to it. Also, he’s not a high-motor kind of guy. There’s no doubt that he has the physical attributes to someday develop into a fine OLB, but picking him early in the draft would be bypassing many talented players who have had more time to develop their skills and to demonstrate them. Agree completely. He looks lost out there a lot of the time and generally slow to locate the ball. What made me really notice him the one good game I got to see him was his size and power when he hit. He seem to be a bigger LB and that makes a difference to me. Interested to see your thoughts on the Jason Babin release and whether you think we should pick him up, particularly with our lack of pass rush recently away. ***Especially with our starting CBs looking to be suspended. Pass rush even more important. Seems like a no brainer to me! Sorry to sound like a broken record, but if I’m the offensive coordinator for the opponent, and I know that you are going to line up Irvin-Jones-Babin-Clemons on passing downs, then I’m going to go no-huddle so you can’t get them on the field, and if you do, they are not going to get on in time to get the defensive signals and line up properly. If you counter by leaving them on the field, then I’m going to pound you and run the ball down your throat. We need to get more pressure from our base D so that our LBs and Safeties can play pass defense. We can then blitz less often and be more unpredictable. I think they’ll trust their guys, not sure who Babin would replace. You’d have to take Clemons or Irvin out of the game to justify that move. Not to mention, Babin was a Seahawk at one -time and was awful. Pretty impressive kid. Extremely athletic for his size and very natural playing, if maybe a bit raw (first season playing defense. Previously a TE). He could use another year at UCLA to develop further, but he has the skill sets to warrant be a first round pick, so he could be that prospect taken earlier than expected because of his upside. Also, cause I know people would be interested, based on a USC fan comment I read, Carroll wanted Barr to play LB out of high school. It’s hard to project him as a WILL for the Hawks, though, since he’s playing a pure 3-4 OLB who basically speed rushes most downs, instead how Carroll is using Hill now in the more typical 4-3 WILL role we use with the position playing 4-5 yards back and not blitzing all that much. I’d prefer Barr (or a guy in his similar makeup) to play the SAM over WILL, to be honest. It seems they play Wright more at the LOS than Hill, and I think that’s Barr’s more natural position (closer to the LOS) and where he’d be more effective rushing the passer, containing the edge, and using his speed to cover. I agree that he seems like more of a SAM than a WILL. He was playing 3-4 OLB up at the LOS on most plays and seems to be used more to set the edge. I think a guy like Mosely, Ogletree, or Arthur Brown projects better at the WILL. I also would like to see how Mike Morgan can play at the WILL as I thought he looked good at SAM while Wright was injured. I think you’re right on in those 3 projecting better at WILL. Mosely is a player I’ve really come to like as a possible 1st round option with Brown a possible 2nd rd option. (Brown reminds me a lot of Lavonte David of last year, if you remember him). Morgan playing WILL is a possible solution, but the Hawks haven’t indicated they see him there, though. They liked his coverage ability enough they used him against the Rams in nickel packages instead of Hill (and Malcolm Smith which I thought interesting, too), yet they’ve only had the two play for the spots they backup, instead of playing the better player at whatever spot opens up. Smith is the fastest of the two and Morgan bigger (which may say they prefer speed at WLB over size) or it could be that their college experience was at the position they are playing now (so letting them play the spots they know). I totally agree with Mosely as a first rounder and Brown as a second rounder. The Lavante David comparision seems good and David has been having a very good year from what I’ve read so I wouldn’t mind Brown in the second. As for Morgan, I agree they haven’t shown any signs that they consider him a canidate to compete with Smith for backup time at the WILL. I noticed Smith in some Sunday but I wasn’t paying particular attention to how he did. Anybody notice anything from his limited snaps? Rob or anyone else watch him play against Stanford? I’d love to hear how he did against those two tightends they have. I saw the first quarter on a very poor quality feed and he didn’t stand out. Then I began watching Notre Dame @ USC. Hopefully the guys will make tape of that game. Of course, we only have to wait until Friday to see a re-match. If they did draft a MLB and move Wagner to WILL I wouldn’t mind, but only if the MLB is truly better than any players on the board that can play WILL. Wagner has been doing well enough at MLB where if there’s no reason to move him unless it means upgrading overall talent. 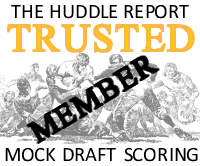 There’s a new mock draft tomorrow – two rounds – for anyone interested in that sort of thing. Very interested! Very intrigued by Barr. Very Ogletree-ish. Always Rob. I wish this was around 1o years ago when all I did was spend too much time on this stuff. Your blog is much appreciated. I always appreciate your view on the draft because it seems like you are the only one who doesn’t seem to “copy and paste” what Mel Kiper and the 2 or 3 other mainstream people say. After watching that tape its clear this is Barr’s first year on D in a while. Bad technique, very raw ect… But wow is he a physical talent. Right now I’d rate him in the mid second round, but if he was to go to a 3-4 team, first round. Something else is that Barkley’s pocket awareness is next to perfect and if KC didnt draft that kid they would make a huge mistake. If they could trade back and get him it would be huge for that franchise. A good staff could have KC competitive year one with Barkley at QB and most that current roster intact. The kid is a bigger version of Drew Brees. Already said as a UCLA and Seahawk fan is love to see us get Barr. Barr was really effective in coverage against Ertz when he was assigned. He has a nose for the ball and makes plays. Word is they might have him on Ertz more we will see on Friday. He needs to put on about 10-15 pounds but has the frame to do it. He would be on the field in some role already in a Pete Carroll defense. He’s got a good feel for the game and would be a nice piece. That said lets pretend he is not ready so I can enjoy him at UCLA one more year! Rob, just watched the film you have up of Barr, Olgoltree, and Dion Jordan. I was really impressed with Jordan’s movement in open spaces, pursuit down the line, and use of hands (arms didnt flop around at all). The one I was must disappointing in was Olgoltree. I’d bet good money he’s not 220 lbs and instead somewhere around 217-219. In coverage he was good but we already have good safeties. When blitzing I only saw speed but very weak upper body strength and weak writs (bad tackling). But like you’ve said his instinct in pass coverage is terrific, not as much against the run. Though I haven’t got to watch his games this year and that film VS the Vols was really it. After watching that tape its clear this is Barr’s first year on D in a while. Bad technique, very raw ect… But wow is he a physical talent. Right now I’d rate him in the mid second round, but if he was to go to a 3-4 team, first round. Athletic skill to go man up but not so much in zone. i can’t see this kid before the end of the third round. he has superior production but screams underdeveloped to me. very few will take such a project like him before the third round. he could do well in a 3-4 scheme but i do like his prospects as a possible WIL. some say he would be a better SAM but i disagree. i think the only reason that wright is playing so close to the LOS is because he can do it better than Hill. bring in a faster version of Wright and put him on the opposite end and Wright is back in coverage. but this kid would need days upon days of just sheer film room and then a ton of time honing instincts before i would consider him anywhere near the first round like so many people are suggesting. he is a poor man’s ogletree, still more athletic than most, just without the learned instincts or coverage ability. the lack of coverage ability is what holds me back the most. kid has the size to cover alot of TE’s but not the route tree understanding to cover them. I can get behind that, good assessment Kenny.